Because there aren't enough end-of-year lists on the internet and because everybody wants to know what I think is important, you will now be subjected to yet another somewhat useless post. On the other hand, for those who are looking for something they haven't read, watched, listened to, or played yet this may prove of some usefulness. In retrospect, 2010 has been a hugely eventful and crazy year for me personally but I seem to have covered that already. So instead lets talk about some of the memorable media that's come out this year, and some which I have only gotten to this year that has been out for some time. In the world of manga there have been several notable releases. 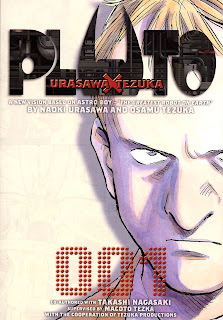 The biggest of these for me was PLUTO by Naoki Urasawa. It has been a while since any manga grabbed me like PLUTO. Since it is a reimagining of Tezuka's Astro Boy it consequently turned me on to a reading of the original Astro manga as well as Urasawa's 20th Century Boys. I'm still planning on getting around to reading Monster as I can't seem to get enough of the complexity Urasawa weaves into his characters and plots. Meawhile, the English version of Biomega by Tsutomu Nihei, one of my favorite artists, was also released. While it is unfortunately not a sequel to Blame! but rather a reinterpretation of the story to some extent, this is Nihei we're talking about so I can't complain. Which brings us to the wonderful world of Anime. Something that was rather momentous which occurred in my small world of Anime was the huge changes that were made to the Aniwave festival. Since leaving Wilmington and passing on the Aniwave torch to another dedicated group of individuals, the festival had well over 400 attendees this year! What unprecedented growth. This made me superbly happy for the future of my humble creation. Several films that I was watching with selection for Aniwave in mind seemed well suited for the festival. Summer Wars was thoroughly enjoyable, brought to us by the people who created The Girl Who Leapt Through Time. Makoto Shinkai's 5 Centimeters Per Second was absolutely superb and I wouldn't have expected any less from him, though I realize that is not actually a 2010 release but it has been floating around in licensing limbo. Similarly, I was impressed by the somewhat older Mind Game, another excellent title from Studio 4°C, which satisfied my hunger for progressive anime. Once the holidays were upon me and the winter blues came around for a bit I was looking to watch another anime series and check it off my entirely-to-long list. For some reason I decided to give Death Note another go. I couldn't get past the first few episodes when it came out originally because the entire premise struck me as juvenile, causing me to dismiss the whole thing. After some reports of the story getting good later on I persevered through the series' initial lull and was pleased to find some substance after L joins the plot. The detective-story styled back and fourth was fun while it lasted, though the ending seemed slightly contrived. Overall Death Note was good in part but still left me with mixed feelings and the occasional wondering of how I could have spent my time better. Absolute Fav: Shinkai does it again, going with 5 Centimeters Per Second. Few can deny that 2010 has a pretty significant year for Hollywood. Not only did we see a lot of blockbusters hit the screen, but they were actually pretty good it seems. This was also the first year that I saw a movie in 3D. Naturally that made an impression on me and regardless of what people say I loved Avatar for being such a visual feast. Yes, I'm still counting it as a 2010 film as it was re-released in theaters this year. As far as definite 2010 releases go, Inception was a great film to get lost in. While nay-sayers decried being left hanging at the end, I had no problems with its ambiguity in hopes of a sequel. On the serious side of things, I saw two excellent documentaries as well. Inside Job reiterated some information I was already familiar with while making explicit much that I was not aware of. It served well to inform but even more to stir the emotions in light of the frivolity with which actions were taken by those in power to make the recession happen. And while we are on this emotional note, Tibet in Song was also rather heart-wrenching at times. It brought me up to speed on the current situation in Tibet and the Chinese influence there. Lest I become to involved with reality, I ended my 2010 in film with my first visit to an Imax 3D theater for a viewing of Tron: Legacy! Both nostalgic and new, Tron was visually fantastic and had my nerdy heart in its digital hands. I loved it enough to come home and watch the original again. Absolute Fav: This is a tough one. While I want to say Avatar or Tron I think I'm going to have to give it to Inside Job. Admittedly, my gaming time tends to be limited these days and most of the year was little to no exception. The most notable new game for me in 2010 was undoubtedly the Cave Story release on WiiWare. In all honesty, I still occasionally pick it up and try to do the old Hell run-through. While I always die at the hands of Balrog, this game has been for some time now and will always be a classic in my book. My other gaming escapades tend to be relegated to older titles that I can get for cheap. As such, I played some BioShock, Oblivion, and Gothic 3 this year on PC. On the Wii I had some fun with SSX Blur, and splurged on Metroid Prime: Trilogy on account of it being out of production. Two new titles that I ended up getting are Sin & Punishment: Star Successor, a great shooter with a nice old-school feel, and A Boy And His Blob, also nostalgic and with nice 2D artwork. I have yet to spend sufficient time with the latter two before I can make a proper assessment. Absolute Fav: That's easy. Cave Story all the way! While the previous year heavily featured more mellow indie music on my speakers, 2010 had we wanting heavier beats and more electronica. Though I would find occasional respite in the soundtracks from the anime Mushishi and the indie-game Machinarium, I began to prefer chiptunes from 8bitstellar and Leeni. Much of the year seemed to be dominated by Lady Gaga and the various volumes of Tecktonik which eventually made way for a return to Daft Punk, Justice, Uffie, and Electric Six. Most recently I have discovered Capsule's fantastic electro fusion of Jpop, house, etc. Absolute Fav: Not sure I can make a choice here. Somewhere between Lady Gaga, Tecktonik, and Daft Punk maybe.